Edwin DeLaRosa has a fresh edit coming from Skavenger. Here’s a quick sneak peek to tease you with until it comes out. This is going to be good. Animal finally uploaded Edwin DeLaRosa’s section from the “Cuts” video. Stop reading and start watching! “These clips of Edwin ended up on the cutting room floor during the editing of the first Animal Video. They were filmed by Jeff Zielinski during 2000 and 2001.” – Animal. To celebrate Dan’s Comp‘s 25 year anniversary, Animal made some fresh Edwin DeLaRosa t-shirts that you can only get from Dan’s. Hit this link to buy one now, or cross your fingers and hope you win one of the 25 signed ones. Animal caught up with Edwin to see what’s good. They talk Skavenger, shop tours, traveling and more. I think this What’s Good thing might be a new series they are doing, so expect more soon. It would appear DC is making moves to expand their BMX program. They announced today the addition of nine, yes nine, new riders. The new pro team riders consist of Brett Banasiewicz, Jeremiah Smith, Craig Mast, Hucker, Anthony Napolitan, Alfredo Mancuso, Kelly Bolton, Brad Simms and Ryan “Biz” Jordan. All of which, other than Maddog (who left Etnies for this opportunity) have been repping the brand for a while now through their flow team and such. 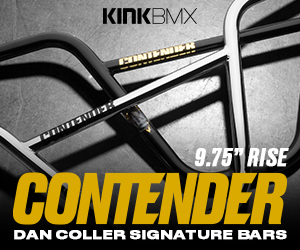 The DC team will continue to support Dave Mirra, Corey Bohan, Chris Doyle, Allan Cooke, Edwin DeLaRosa and Rob Wise. What does this mean? Well, I’m going to assume a whole bunch of edits popping up. Maybe they have a new full-length video in the works? That would make sense with a line up that powerful.